Corp. Office: 101-106, IT Tower - 1, Info city, Gandhinagar - 382009, Gujarat. Regd. Office: Block 15. 2nd Floor, Udyog Bhavan, Sector 11, Gandhinagar - 382010, Gujarat. 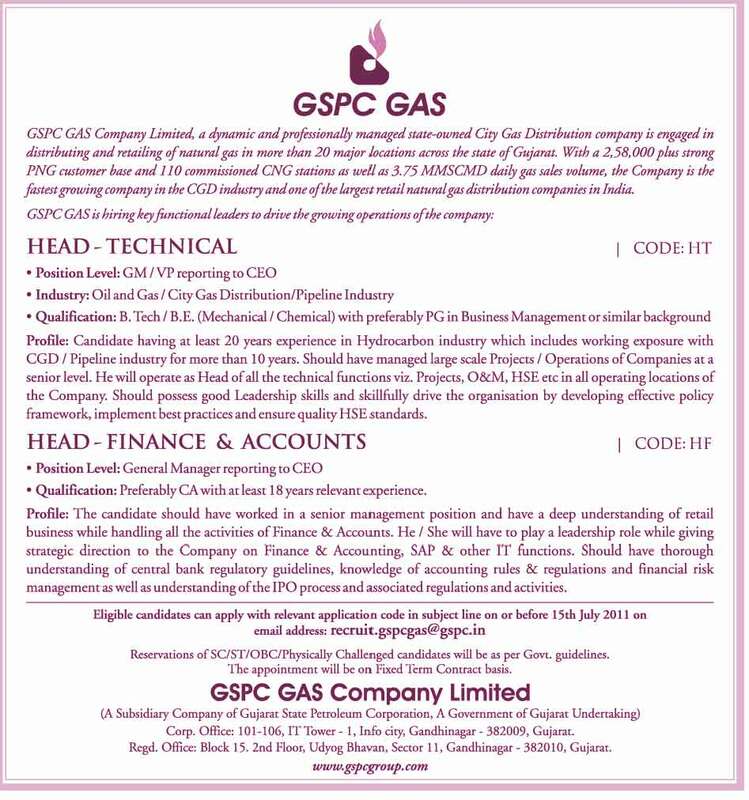 GSPC GAS Company Limited, a dynamic and professionally managed state-owned City Gas Distribution company is engaged in distributing and retailing ofnatural gas in more than 20 major locations across the state of Gujarat. 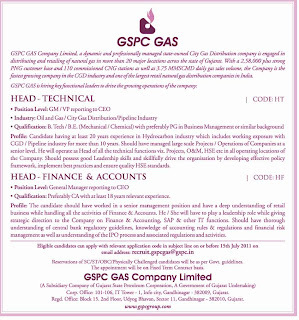 With a 2,58,000plus strong PNG customer base and 110 commissioned CNG stations as well as 3.75 MMSCMD daily gas sales volume, the Company is thefastest growing company in the CGD industry and one of the largest retail natural gas distribution companies in India, GSPC GAS is hiring keyfunctional leaders to drive the growing operations ofthe company. Profile: Candidate having at least 20 years experience in Hydrocarbon industry. • Qualification: Preferably CA with at least 18 years relevant experience. Profile: The candidate should have worked in a senior management position and have a deep understanding.